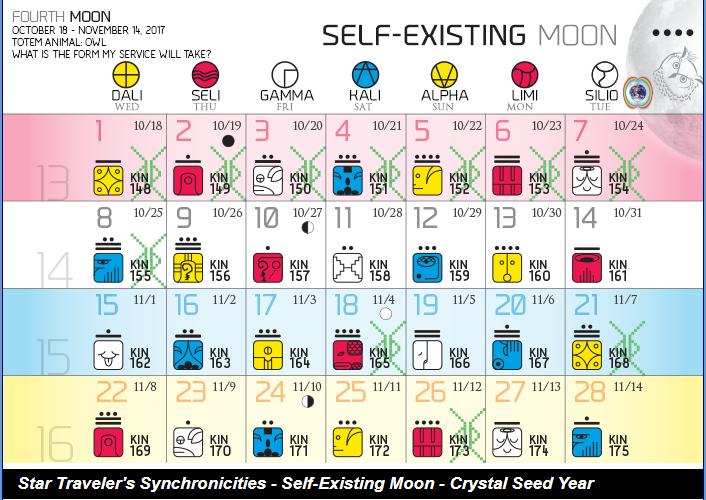 Today Kin 148 (Gregorian Date October 18th 2017) we start a journey into a new moon (month), Moon 4 of the 13 moon calendar. The Self Existing Moon of Form. This moon starts off with 8 galactic activation portal days which is a very potent start as we are literally going through 8 gates of cosmic energy. On galactic activation portal days, the veils between the dimensions are thinner allowing for greater access to higher energies, higher realms, higher dimensions. This is a perfect time to tune in to receive cosmic information. Cosmic History Quote for Moon 4, Day 1 – Form is how a self-evolving universe makes its intrinsic structures perceptible. What is the form my service will take? This Self-Existing Moon we are being called to define and redefine our form of perception and action on behalf of the whole. The first step is by listening to and heeding the voice of our true essence. In this moon we define new form. 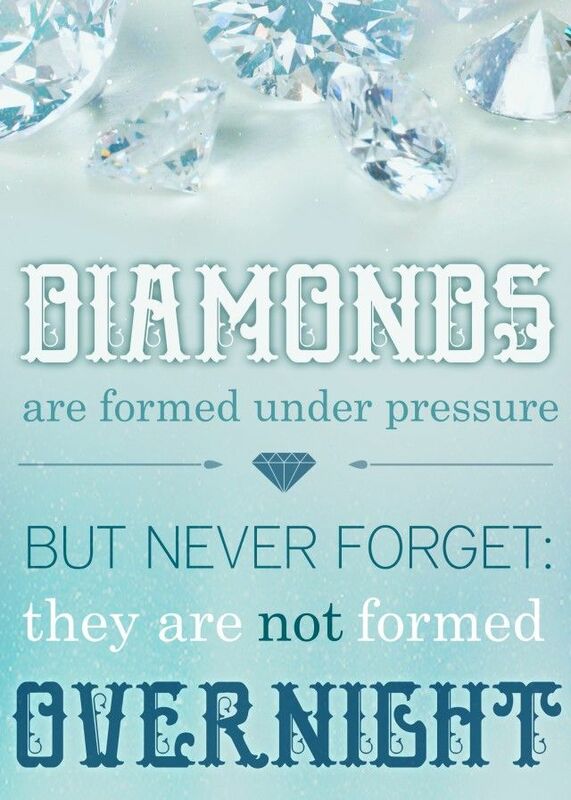 We are at a time of dispelling old elements and constructing new patterns. In this Moon we ask ourselves: What form will my service take? But to know the form means defining the context. Currently it appears as if we live in the shadows of the consciousness of a Planet that is out of alignment with the axis of Spirit. But everything is a part of the sacred reality and can be transformed into the higher consciousness. Yellow Overtone Star – HO LAMAT HUNAB KU guides and teaches us to harmonize with the ongoing masterpiece of the dream of creation through focusing on the simple beauty found infinitely in life and to mindfully ease our way into the natural flow of Divine Elegance in order to become centered and balanced in the heart-center of our Essential Being. All radiance flows from the heart-center of our Essential Being. All true empowerment comes from dwelling in the heart-center of our Essential Being. The correct command of our lives and resources is an expression of a centered state of being. Yellow Overtone Star – HO LAMAT HUNAB KU reminds us that when we are centered and balanced in the heart-center of our Essential Being, we naturally radiate outwards in all directions, endlessly transmitting intelligent vibrational energy that is perceived and felt in ever-widening, energetic rings. 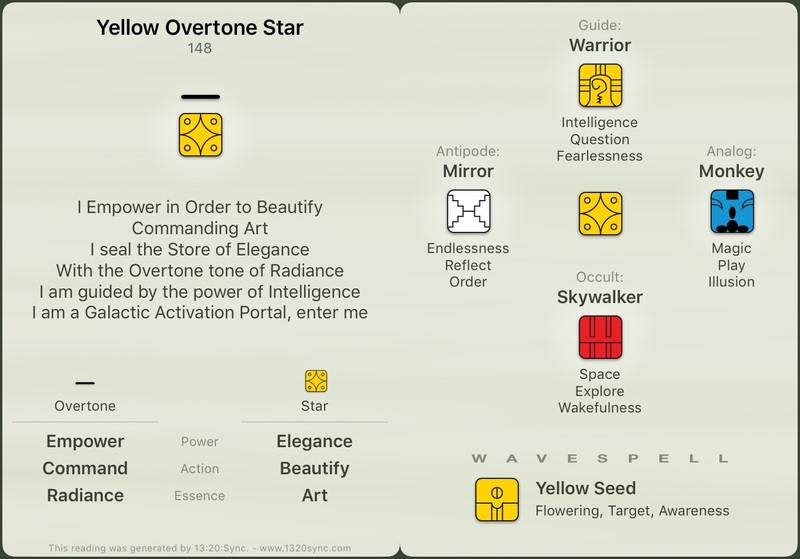 Through the energies of Yellow Overtone Star – HO LAMAT HUNAB KU, the Cauldron of Creation is summoning us to sparkle, shine, and glow, in order to be Art. The Cauldron of Creation invites us to intentionally anchor ourselves to the core of our authentic Self, our Essential Being, so that we may surrender to the expression of the endless surges of invisible currents of continual change, which re-arrange, re-direct, and quicken the dream of our existence. New energetic powers of Divine Wholeness are offering themselves to be claimed and actualized. Let us all cast our unlimited intelligent radiant vibrational energy out into the endlessly vast and unconditionally loving arms of our unseen Creator and receive back divinely intelligent and ever new inspiration through sacred communications continually moving through the conduits of our human vessels, for the good of all, in order to glorify our Great and Wondrous Creator. Precept for Kin 148 – Precept 44 – Your identification must change to that of a planet sorcerer cultivating your multidimensional paranormal powers to aid in the supermental evolution of the planet. Nothing else exists. Precept for the first week of moon 4– According to Cosmic History, yoga exists as a necessary system to facilitate this next stage of transformation where the human mind and soul experiences unification at a noospheric or planetary level.